Looking for a mix of meditation and deep stretching? Yin Yoga is exactly what you need. Try out a class with Desiré at the new Japanese-inspired yoga studio, Kintsugi. The class takes place in a stunning Salt Room with walls made of pink Himalayan salt – known to have many benefits for the body. Ready to practice yoga in a room heated to 40 degrees? Bikram Yoga is a super sweaty and intense workout that has a lot of benefits. If you’re up for the challenge, try out a class with Lilliana at Dryp – one of our favourite hot yoga studios in Dubai. If you’re looking for a relaxing yoga class, where you can swing, stretch and hang upside down, try out a swing yoga class with Peewee at Voyoga. This studio offers one of the best swing yoga classes in Dubai, and it’s got stunning views from the 34th floor! Yogis, if you haven’t tried out a yoga class with Nitai – you’re missing out! Each of his classes are mindful and (very) powerful, and he’ll get you into poses you wouldn’t think were possible. Sign up for his Vinyasa Flow class at Urban Yoga or even Voyoga to check it out. The Ashtanga Yoga primary series is a mix of strengthening and flexibility poses, and an awesome workout if you’re up for a challenge. 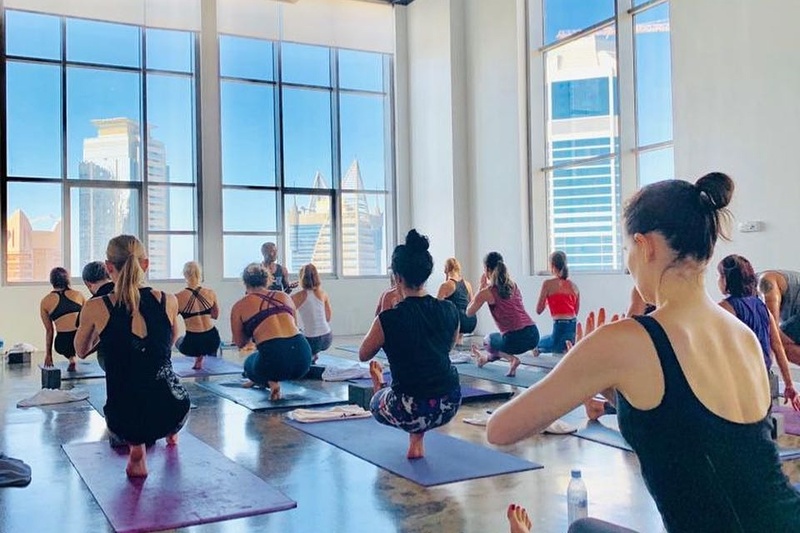 Since it’s not usually an instructor-led class (the teachers talk you through the poses, rather than practice with you), Yoga House now has two Ashtanga classes – one for the newbies and one for the regulars.